Buffalo being chased off a cliff as seen and painted by Alfred Jacob Miller in the late 19th century. Hunters herded the bison and drove them over the cliff, breaking their legs and rendering them immobile. Tribe members waiting below closed in with spears and bows to finish the kills. The Blackfoot Indians called the buffalo jumps "pishkun", which loosely translates as "deep blood kettle". This type of hunting was a communal event which occurred as early as 12,000 years ago and lasted until at least 1500 AD, around the time of the introduction of horses. The broader term game jumps includes buffalo jumps and cliffs used for similarly hunting other herding animals, such as reindeer. The Indians believed that if any buffalo escaped these killings then the rest of the buffalo would learn to avoid humans, which would make hunting even harder. 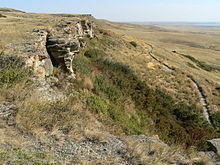 Buffalo jump sites are often identified by rock cairns, which were markers designating "drive lanes", by which bison would be funneled over the cliff. These drive lanes would often stretch for several miles. Buffalo jump sites yield significant archaeological evidence because processing sites and camps were always nearby. The sites yield information as to how the Native Americans used the bison for food, clothing and shelter. Plains Indians in particular depended on the bison for their very survival. Every part of the animal could be used in some way: hides for clothes and shelter, bones for tools, sinews for bowstrings and laces. Hooves could be ground for glue, and the brains could be used in the tanning process for the hides. The extra meat was preserved as pemmican. one of the most active and fleet young men is selected and disguised in a robe of buffalo skin... he places himself at a distance between a herd of buffalo and a precipice proper for the purpose; the other Indians now surround the herd on the back and flanks and at a signal agreed on all show themselves at the same time moving forward towards the buffalo; the disguised Indian or decoy has taken care to place himself sufficiently near the buffalo to be noticed by them when they take to flight and running before them they follow him in full speed to the precipice; the Indian (decoy) in the mean time has taken care to secure himself in some cranny in the cliff... the part of the decoy I am informed is extremely dangerous. Despite having described a jump in detail, neither Lewis nor any white settlers are known to have personally witnessed the events. Sites of interest include Head-Smashed-In, Bonfire Shelter, Ulm Pishkun, Madison Buffalo Jump, Dry Island, Glenrock, Big Goose Creek, Cibolo Creek, Vore, Too Close for Comfort Site, Olsen-Chubbuck Bison Kill Site, and Camp Disappointment of the Lewis and Clark Expedition. Ulm Pishkun Buffalo Jump is likely the largest buffalo jump in the world. It was used by the Native Americans in the area between 900 and 1500 AD. The cliffs themselves stretch for more than a mile and the site below has compacted bison bones nearly 13 feet (4.0 m) deep. Ulm Pishkun Buffalo Jump is located in First Peoples Buffalo Jump State Park in Cascade County, Montana, north-northwest of the community of Ulm. Madison Buffalo Jump State Park is a Montana state park in Gallatin County, Montana in the United States. The park is 638 acres (258 ha) and sits at an elevation of 4,554 feet (1,388 m). The park is named for a canyon cliff used by Native Americans as a buffalo jump, where herds of bison were stampeded over the cliff as an efficient means of slaughter. This limestone cliff was used for 2,000 years by Native Americans. Madison Buffalo Jump State Park is a day use-only park. It is open year-round for hiking, wildlife observation, and some picnicking. Camp Disappointment, the northernmost point of the Lewis and Clark Expedition, is among the best-preserved buffalo jumps in Montana, due to its relatively inaccessible location. The creek at the bottom of the cliff periodically exposes animal bones. There is a 3-D reconstruction of Charles M. Russell's painting of a buffalo jump on display at the Helena State Capital Museum, Helena, Montana. Wikimedia Commons has media related to Buffalo jumps. ^ Mass Kills. Texas Beyond History. ^ "About the Vore Buffalo Jump". Vore Buffalo Jump. Vore Buffalo Jump Association. 2007. Archived from the original on May 11, 2010. Retrieved August 4, 2009. ^ "Madison Buffalo Jump State Monument". Geographic Names Information System. United States Geological Survey. June 1, 1995. Retrieved July 13, 2010. ^ a b "Madison Buffalo Jump State Park". Montana Fish, Wildlife and Parks. Archived from the original on July 10, 2010. Retrieved July 13, 2010. ^ "Camp Disappointment" (PDF). National Register of Historic Places. National Park Service. Retrieved May 17, 2015.